Sunnyside Dru: the garlic is coming! 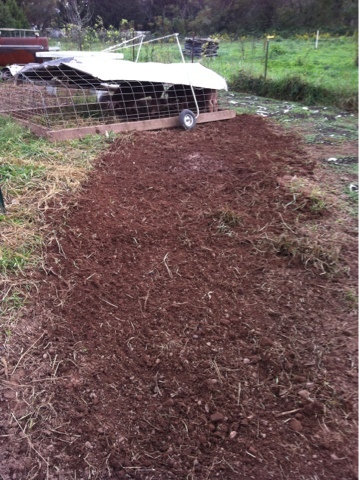 The pigs are working, continuing to clear vegetable planting areas. With temperatures predicted to fall in the low 30's, we clear the beds that have been planted with the summery stuff. Yesterday leeks went in. The garlic is on order and is scheduled to be delivered any day, and the sooner it gets in the ground the better results next year. The pigs are happy to root up any little thing in the planting beds and walkways. There are bugs that lay eggs in the ground, and as the pigs clear out the tasty roots they are happy to eat any bug eggs too. Chickens will follow and do the same. By next summer there will be weeds in the bed, but for now it is just limitless possibilities!